Our panoramic restaurant, the Rem', and our champagne bar, le Blanc de Bulles, welcome you for a sparkling, gourmet break! Our 4-star hotel is ideally located just a short distance from Notre Dame Cathedral, a gem of Gothic artwork, and the congress center. Whether you're on a business trip or a family vacation, you will love the quality of our facilities and the comfort of our rooms. Our work spaces, combine technology and modularity and have everything you need. 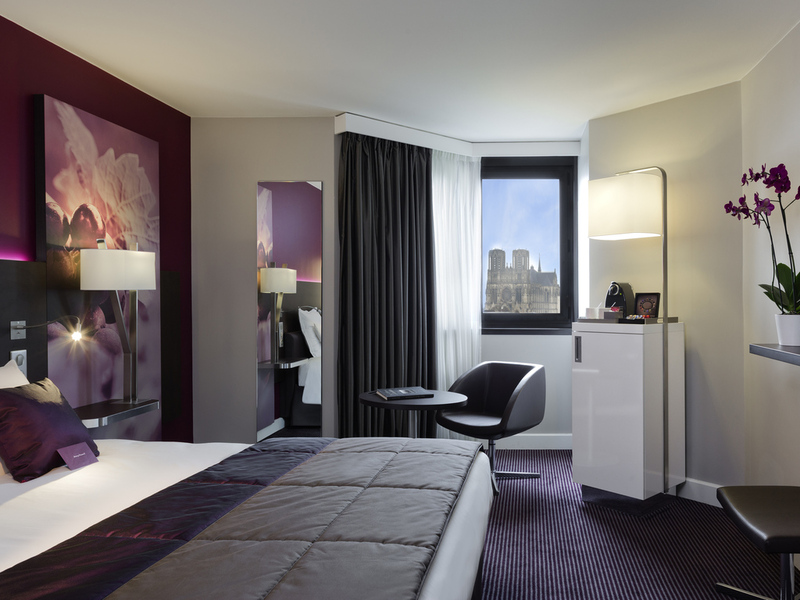 All the services we offer at our Mercure will mean you have a great stay in the heart of Reims. For food lovers: Be sure to visit our restaurant, Le Rem', on the mezzanine which offers simple, regional and seasonal cuisine. We stopped here again on the way back from the Alps - it is perfect for getting to the Eurotunnel in the morning. We were given a lovely room. An initial problem with the toilet continuously flushing was fixed straight away - nothing is too much trouble. Staff are so lovely and helpful. Fantastic breakfast. We will definitely return! thank you. The staff was friendly and helped us receive champagne boxes from local producers and traders. Also, there is a good parking lot behind the hotel where we could park every night. Great hotel, with an equally great location. It's hard to find any fault with my experience at the hotel Reims Central Cathedral. It was close to the Cathedral and several other sights. The town centre was a short stroll away. The staff was welcoming, friendly and helpful. The restaurant was lovely and so too was the waitstaff. This was my second time staying at this hotel and I will definitely stay here again when I have the need for a hotel in Reims. Quality hotel, rooms too hot. Service at reception was efficient, the beds are comfortable. The corridors and rooms are always too hot and the air conditioning doesn’t work. My car always scrapes on the top of the car park ramp - it needs to be smoothed out a bit. Nice hotel, but keep the heat down! Good, pleasant. Nice to have boxes of champagne on special offer! Rooms and corridors were far too warm - uncomfortable and not good for the planet! Very good hotel which I would use again. My only criticism is that on the second day, the cleaner did not reach my room until 5pm. Far too late in the day and as I needed to work - my room was not made up. Lovely helpful staff willing 'to go the extra mile', comfortable bed in a lovely room, good position - what could be better? It was fine. The whole experience was a bit clinical. parking was very tricky with a roof rack, I got stuck at the bottom of the steep sloap down to the basement parking area. There was no warning at the top, nor did the concierge warn me. I had to reverse all the way back up. There was no bath, only a shower. The dinner and breakfast were satisfactory. Otherwise the stay was fine. Check in was very easy and the staff were keen that we had all the information we needed about the hotel and Reims. The hotel is in easy walking distance of the centre of town. The beds were very comfortable and there was a lovely spread at breakfast. I am a big fan of Accor hotels especially in France where our small dog is accomodated without any fuss. For our most recent stay in this hotel we chose a superior room with its own coffee machine in the room which was a nice extra to have. I always like to have the window open at night because otherwise I get a bad chest and cough. Our superior room had a nice view of the canal however there is also a busy road running alongside it so we had traffic noise all night. One night stop over en route to Calais. We have stayed at this hotel many times a year for abou 20 years, it is midway to our chalet near Annecy. This recent visit was uncomfortable as the air conditioning did not function, an experience we have had in the past. The food in the restaurant has gradually got worse and and on the a casino prior to this a complaint made at the the time of the meal was ignored but not charged until a few days after we left. Evenin though we checked out as normal, our card details were retained. We have stayed in your hotel on at least 5 previous occasions and on each visit were offered a free drink. The fact that we were not offered one on this occasion was I guess due to my status having lapsed - at the same time all my accumulated points were deleted. Circumstances over the last two years prevented me from travelling and using Accor hotels. Aside from this we found the hotel to be overly warm. Completely friendly, professional, efficient, clean and great value. Your reception and breakfast staff were super efficient and they smiled and were absolutely brilliant. I was staggered to be honest. I had emailed to say my wife was ill and we only needed one instead of two rooms. On arrival the staff sorted this out quickly and with zero issue. Fantastic.